It feels strange to be marking the end of 2018, a year which for me had its own rhythm, split as it was into three phases each with a distinct pace. I am pretty used to deadlines, and as I raced towards a major personal one in early May I packed in as much as possible on the work front. As well as continuing my column for Art Monthly Australasia magazine ‘Notes from the Field’, I wrote catalogue essays for Sydney artist Michelle Cawthorn, and for the group exhibition Vanishing Point at Hazelhurst Arts Centre. 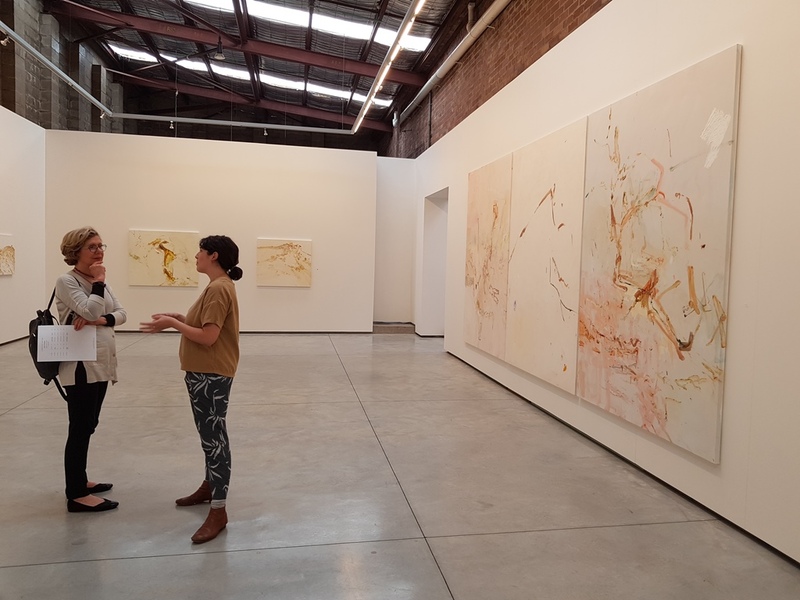 I led visiting art patron Marilyin Greenberg, previous council chair of the Elizabeth A. Sackler Center for Feminist Art at the Brooklyn Museum, on a personalised tour of commercial gallery spaces across Sydney. As always, I appreciated the opportunity to travel for art. 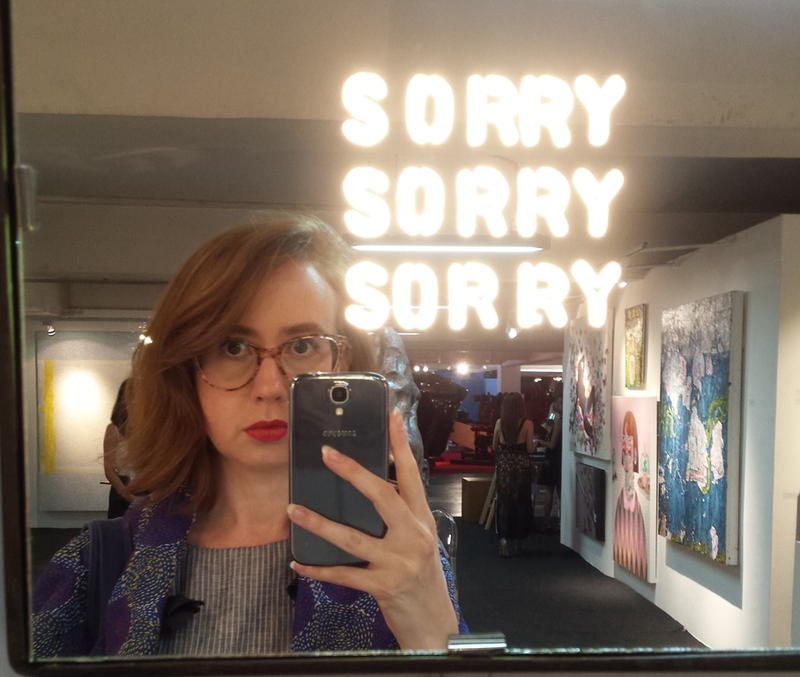 In early March I visited Adelaide, filing a review of the Adelaide Biennial for Vault. 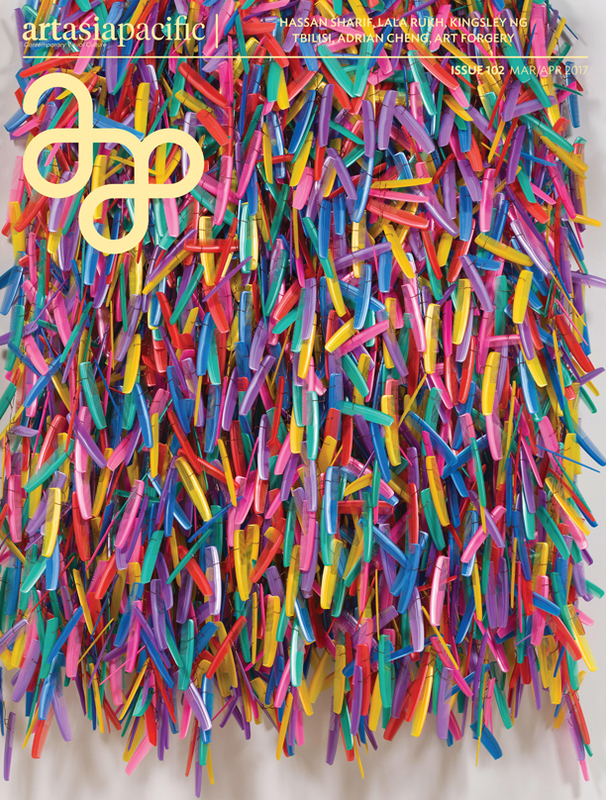 A major highlight was a press trip to Hong Kong Art Week in late March for Art Monthly. I reviewed Encounters (curated by Alexie Glass) at Art Basel Hong Kong and blogged about the fair overall. I also interviewed Suhanya Raffel, Executive Director of M+ and reviewed Samson Young’s exhibition at M+ Pavillion . 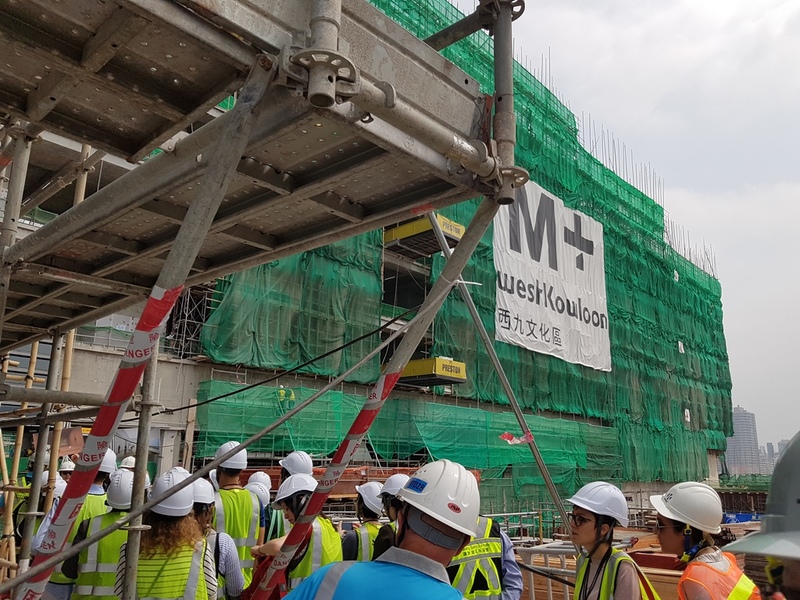 As I was 32 weeks pregnant it was a challenging trip energy-wise, particularly climbing the many flights of stairs during the site visit to the under-construction West Kowloon Cultural district! The middle of 2018 saw me take a 4-month professional hiatus as my husband and I welcomed our baby into the world. Despite me stepping back from work, baby’s early months were filled with many gallery visits (including a ferry trip to Cockatoo Island to visit the Biennale of Sydney when he was four weeks old). Following that personal milestone there continued to be many professional highlights. 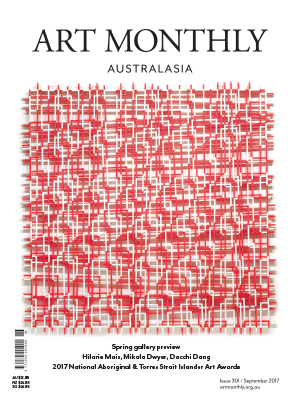 After an interview with Malaysian artist Minstrel Kuik earlier in the year, I continued to contribute to ArtAsiaPacific, with reviews of Jess Bradford‘s exhibition at Galerie Pompom, and Fearless: Contemporary South Asian Art at the Art Gallery of New South Wales. 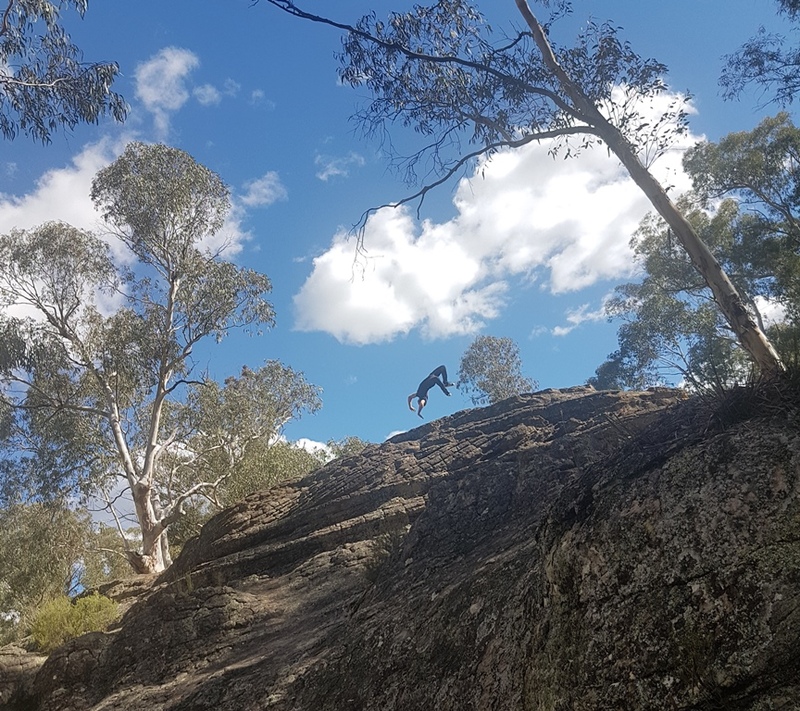 I resumed ‘Notes from the Field’, including for focus issues on South Australia (November) and Brisbane (for the Asia-Pacific Triennial over Summer). 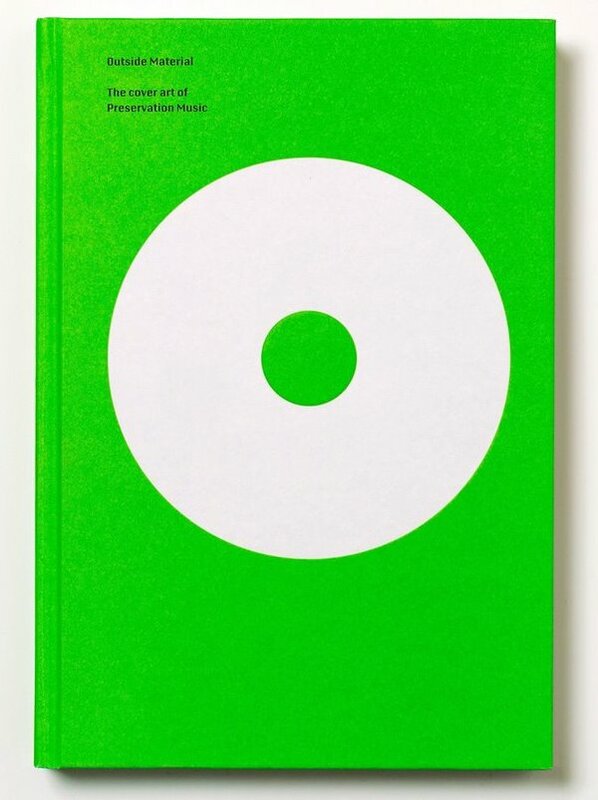 As well as contributing to these print and online publications, this year I worked as a freelance arts administrator, researcher and editor on a range of diverse projects for clients including consultant John Cruthers, publisher and designer Mark Gowing of Formist, and artist and curator Glenn Barkley. I appreciated the continued work with these art-world contacts and forged new ones, including a meeting with New York Times and Art Newspaper Los Angeles Correspondent Jori Finkel as the year drew to a close. I’m looking forward to the start of a new year as an opportunity to gather new energy and recalibrate. With a press trip to Singapore Art Week fast approaching, 2019 promises to be action-packed. Wishing you good health and happiness in the new year. This entry was posted in Words on 31/12/2018 by Chloé Wolifson. 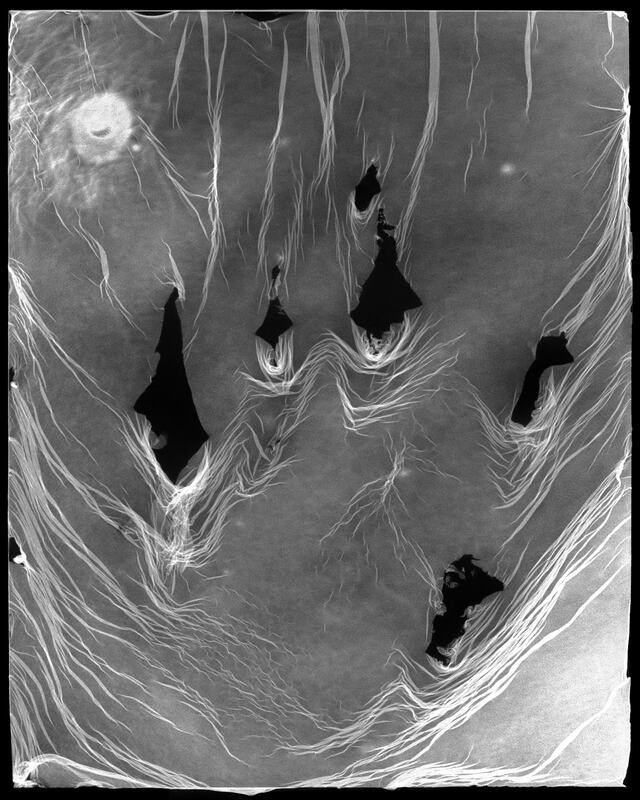 Ioulia Terizis, Slivers and Shard (detail), 2017, Gelatin silver photograph, 115.0 x 83.0cm. Courtesy the artist. It’s wonderful being asked to write catalogue essays for artists. The process, particularly studio visits, give a special insight into an artist’s practice and their world more broadly. Recently I was commissioned to write two artists texts: Ioulia Terizis’ exhibition Quanta at PhotoAccess in Canberra, and Lucas Davidson’s A Strange Loop at Dominik Mersch Gallery in Sydney. Both artists use photography in different and intriguing ways and this was a great chance to really sink my teeth into ideas around photomedia, expanded photography, and light. This entry was posted in Words on 19/07/2017 by Chloé Wolifson. It was a pleasure to be invited to Manila to cover Art Fair Philippines for Art Monthly Australasia. This complex city has an intriguing history and thriving art scene. My fair wrap-up was published in full in the April issue of the magazine with a preview on the AMA blog. This entry was posted in Words on 19/04/2017 by Chloé Wolifson. 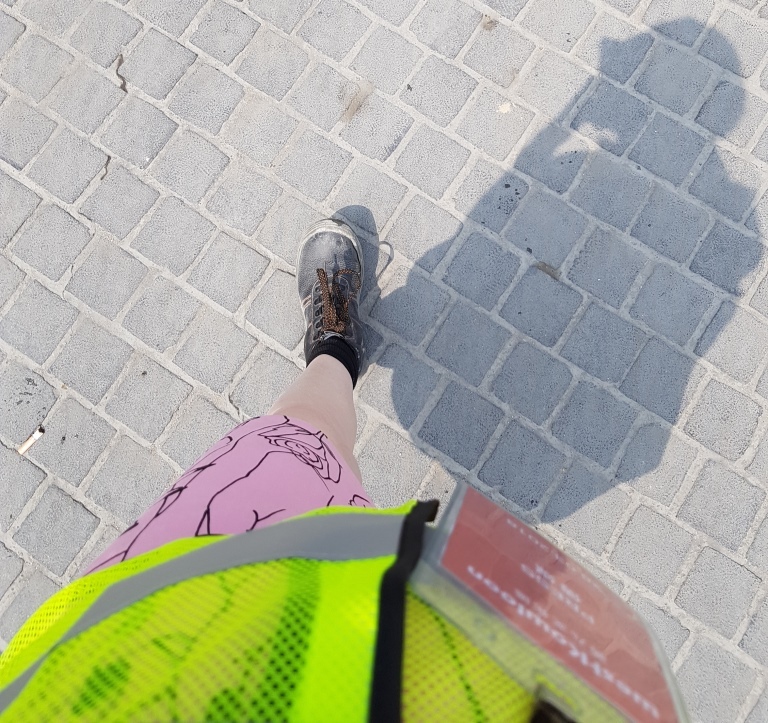 A few hundred words into writing this, I clicked ‘Save’ and Word suggested the filename ‘between accident and intent’ – a fragment of text still floating at the top of the page. It seems apt to embrace this chance title. 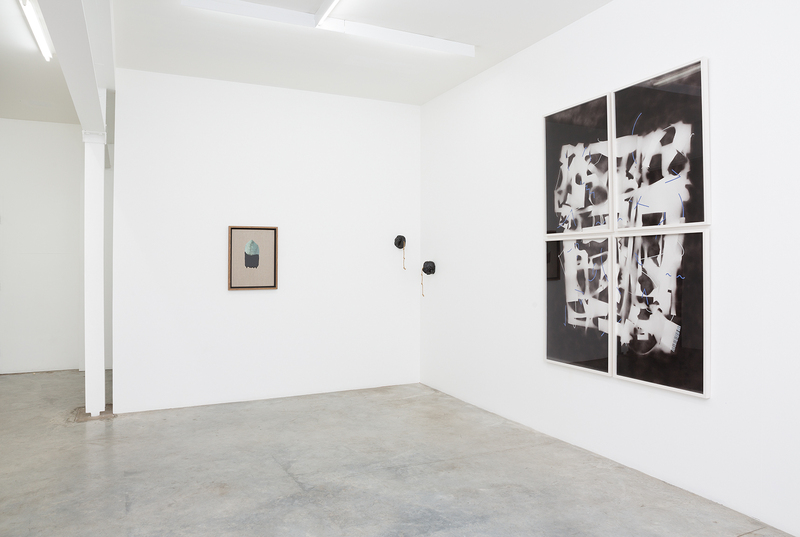 While the intention of World Material was to explore the resonances within and between the works of these artists, many of the connections that have arisen during the show’s subsequent development and installation have been surprising and even uncanny. The expanded material, spatial, geographic and conceptual potentials of these works collide at a number of points. Fictions are employed in order to reveal new truths. 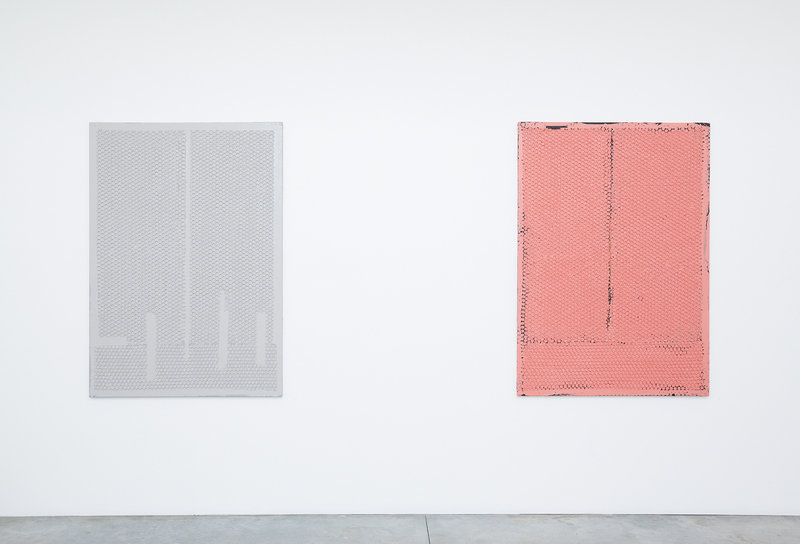 Louise Weaver’s paintings might appear to be encased in the bubble wrap and packing tape that would have protected them in storage or transit, but are actually constructed from ‘skins’ of paint that have been built up on another surface before being applied to canvas as abstract colour fields. Like Weaver, Connie Anthes confounds expectations in her construction of a painting’s surface, her work Untitled (Shadow Figures) employing a soft sculpture as a stencil, with the perceived depth of the resulting two-dimensional impression disrupted by a scattering of flatly-painted glyphs. The River Red Gum ‘branches’ nestled among Yasmin Smith’s Ntaria Fence are actually slip-cast ceramic proxies, glazed with wood ash collected from the same area of Hermannsburg, Central Australia as the branches themselves. 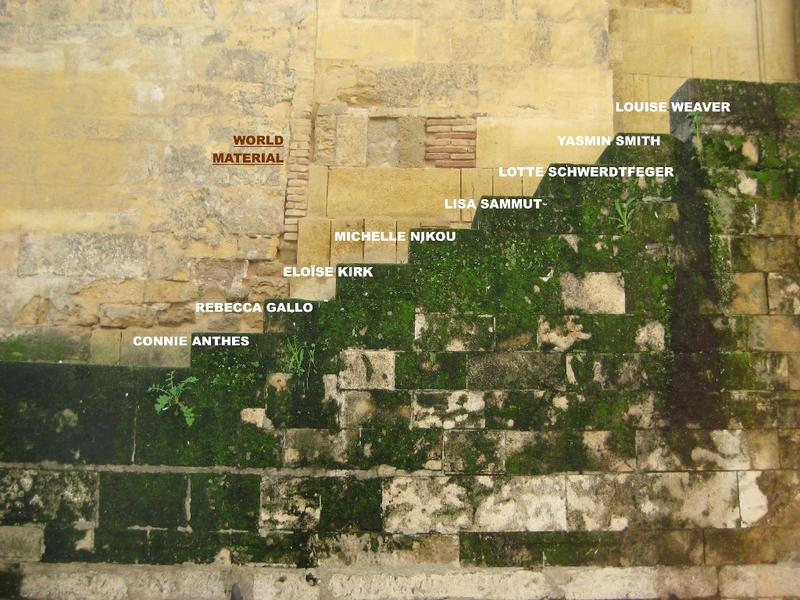 Like Smith, Lotte Schwerdtfeger and Rebecca Gallo also present expanded understandings of landscape through the materials and forms they employ. 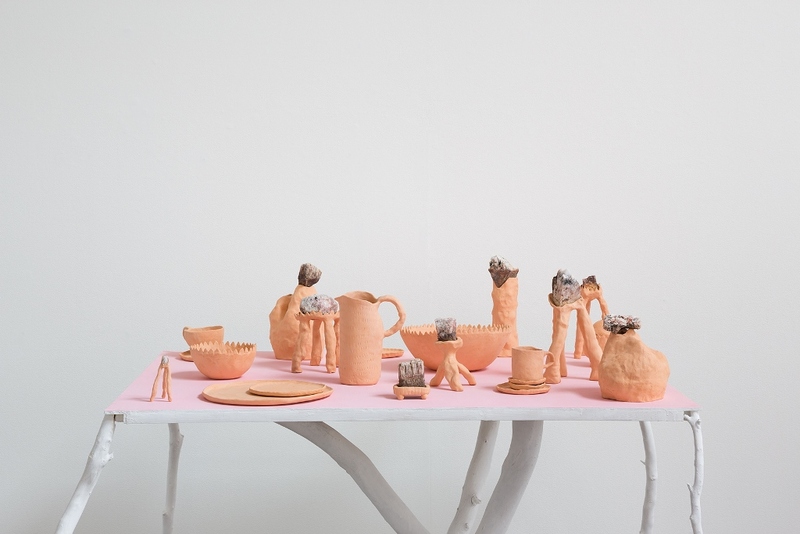 Using natural clay sourced from the goldrush-ravaged Fryers Forest region of Victoria, Schwerdtfeger houses pieces of shattered local bedrock in specially-shaped plinths, interspersed with conventional pottery forms evoking a human presence. In Gallo’s sculptural installations, objects that once lay inert in places like Hill End, Fowlers Gap, Emu Plains and Sydney’s inner west have been reactivated, carefully incorporated into totemic compositions that are both fragile and playful. The perfectly mundane is conjured into significance in the hands of these artists. 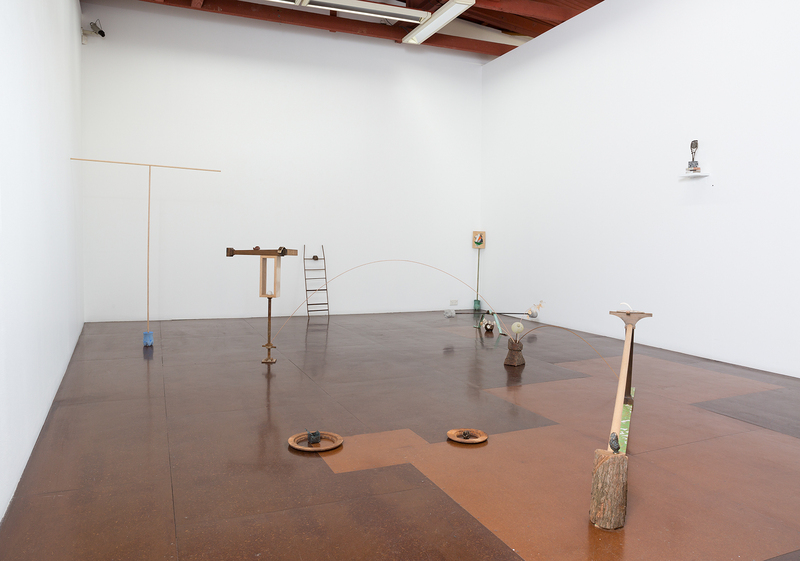 In Gallo’s works a fine balance is quite literally struck between found, carved and cast objects; An upturned ice-cream container rests jauntily on one of Smith’s Red Gum branches; In Weaver’s hands the trappings of a gallery stockroom become a lunar surface; Michelle Nikou transforms clothes dryer lint into domestic motifs; The notorious Mac ‘spinning wheel of death’ hypnotises in Anthes’ Mantle Piece. dimensions variable. Image courtesy the artist. 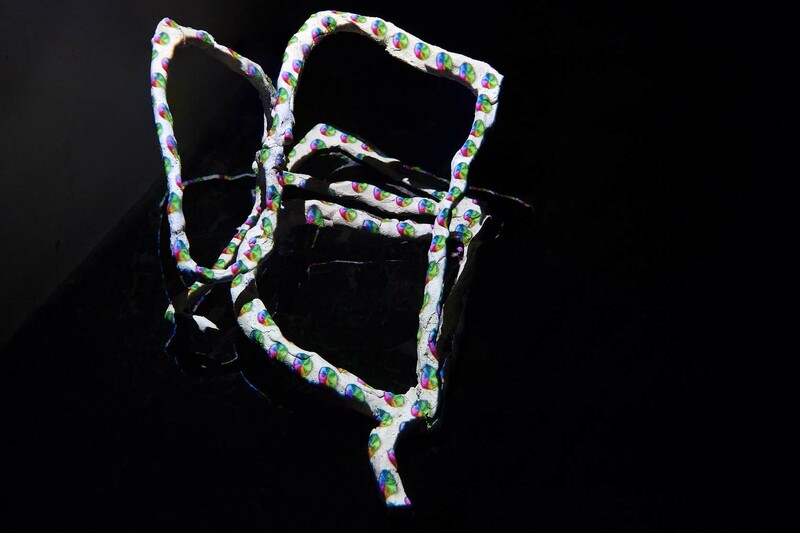 The folding and unfolding of planes that occurs in Mantle Piece, as a three-dimensional object is flattened into two dimensions then reprojected onto itself, creates an ambiguity in spatial comprehension. To do this Anthes uses orthographic projection, a technique that has been employed since antiquity to map star systems. 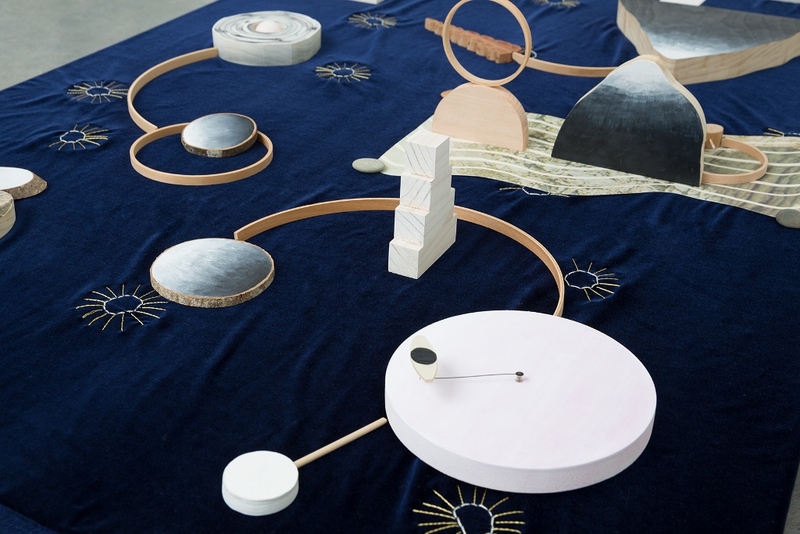 Lisa Sammut’s work form deforms you is also a spatial map, in which organic and geometric motifs are connected atop an indigo velvet surface to create a sense of cosmic time, distance and scale. The flat-sided forms in Sammut’s microcosmic cosmos feature painted or collaged surfaces which transform their diorama-like simplicity into dimensional portals. Eloïse Kirk also employs collage, exploring its intersection with painting in abstracted landscapes that are forged in the connections between organic elements and in the space between the romantic and the surreal. The title of her painting Ultra Plinian alludes to volcanic eruptions, and a geological form in the centre of the composition oozes black resin. The works in World Material embody a sense of expanded possibility. Our world has held these materials, and these materials now hold new worlds for us. Thanks to the artists, those who supported the transport and installation of their works, The Commercial , & the Darren Knight Gallery team. 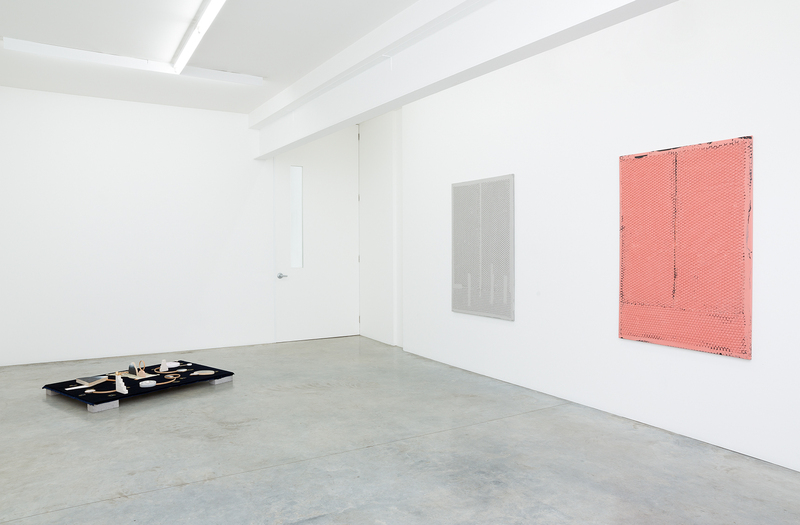 World Material continues at Darren Knight Gallery until 25 February 2017. This entry was posted in Curatorial, Words on 11/02/2017 by Chloé Wolifson. My latest curatorial project, World Material, is currently on show at Darren Knight Gallery, Sydney. 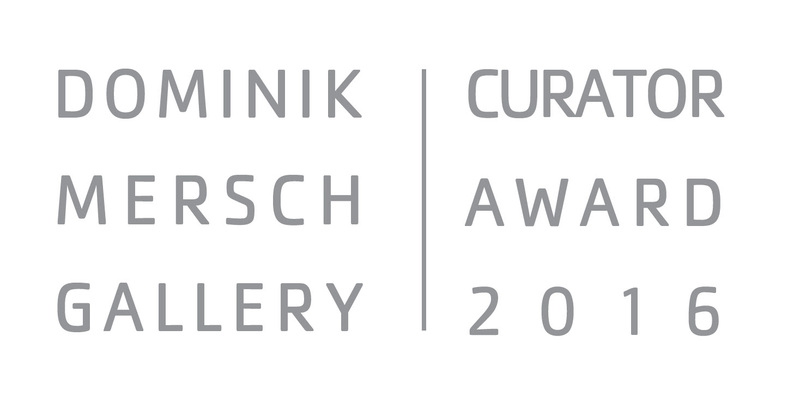 The exhibition features the work of eight Australian women artists: Connie Anthes, Rebecca Gallo, Eloise Kirk, Michelle Nikou, Lisa Sammut, Lotte Schwerdtfeger, Yasmin Smith (courtesy The Commercial Gallery), & Louise Weaver. World Material brings together the work of Australian artists whose works explore the spaces between strength and delicacy, between the material and the conceptual, between accident and intent, between the real and the fictional, and between representation and abstraction – embodying an exploration, recontextualisation, and sometimes deliberate obfuscation of natural, found and human-made materials. 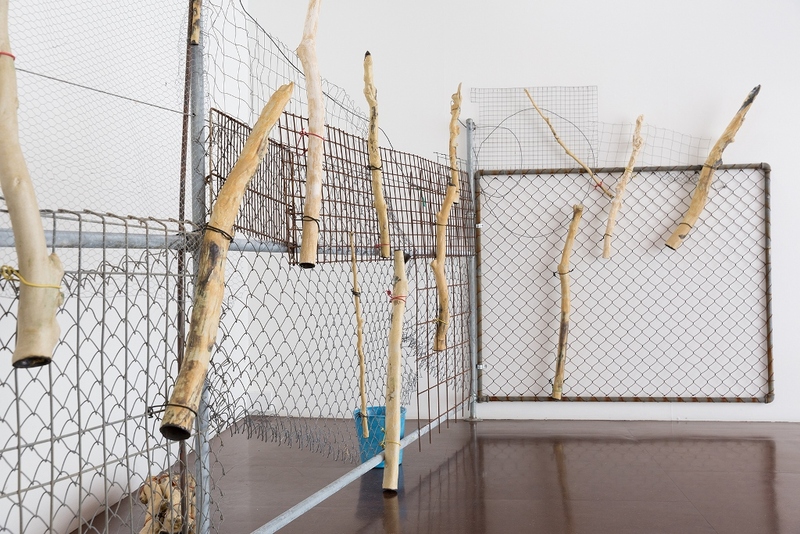 The exhibition is intended as an exploration of these tensions, suggesting totem-like resonances within and between the works of these artists. 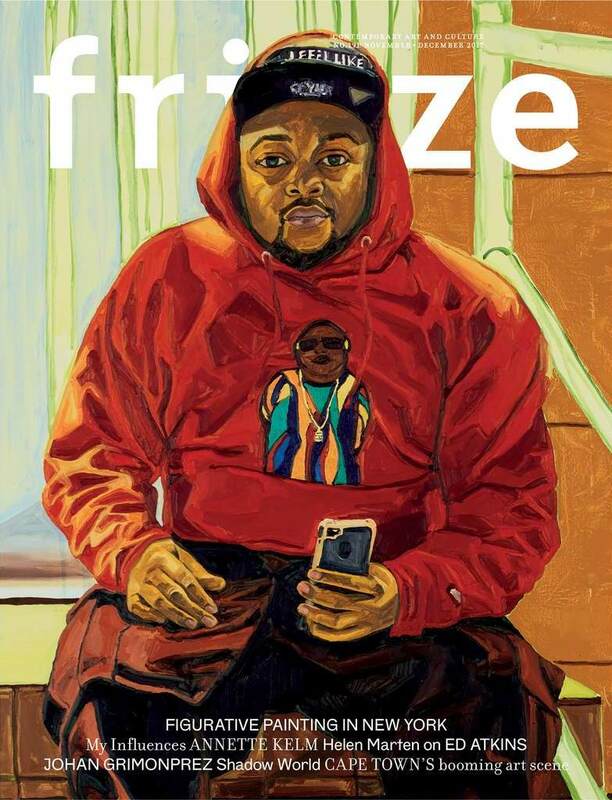 Images of the exhibition are here, artists biographies here, and exhibition text here. The show runs from 28 January – 28 February 2017. If you are in Sydney I hope you can make it. This entry was posted in Words on 28/01/2017 by Chloé Wolifson. Phew! My last few writing deadlines for the year are out of the way, just in the nick of time. 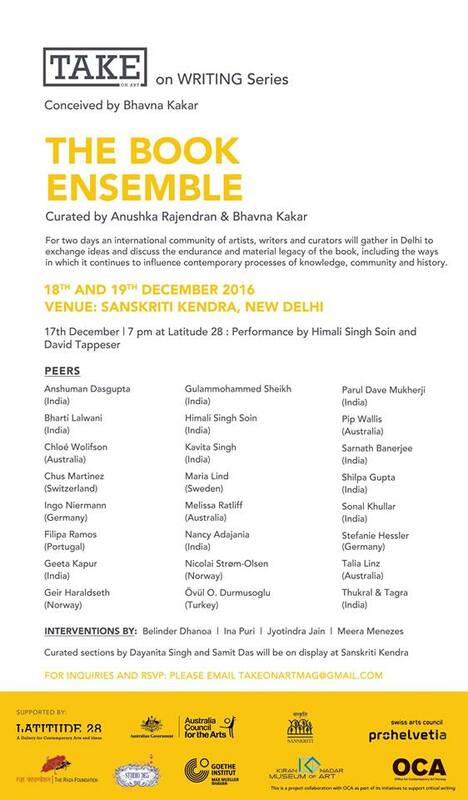 I am honoured to be invited to Delhi by TAKE on art Magazine to join a great bunch of artists, writers and curators from around the world for ‘The Book – Ensemble’. Curated by TAKE editor and publisher Bhavna Kakar and curator and assistant editor for TAKE, Anushka Rajendran, the Ensemble will, over the course of two days, exchange ideas and discuss the endurance and material legacy of ‘The Book’, including the ways in which it continues to influence contemporary processes of knowledge, community and history. This entry was posted in Words on 14/12/2016 by Chloé Wolifson. How exciting to be included in Melbourne University Press’ recent publication Art + Climate = Change, edited by Guy Abrahams, Bronwyn Johnson and Kelly Gellatly, with my essay Charmaine Pike and Sue Lovegrove: Landforms and Lagoons; Martin King: Forest of Dreams. The Copyright Agency released an excellent publication called Voice of the artist, co-ordinated by Nick Garner and edited by Tristan Chant. I loved putting together the essays The Hero Image and The Rise of the forgery: how the internet has increased instances of forgery and the misattribution of artworks – a change of pace from an exhibition-based writing focus. This entry was posted in Words on 13/12/2016 by Chloé Wolifson. ArtChat. Fast chats on hot topics! 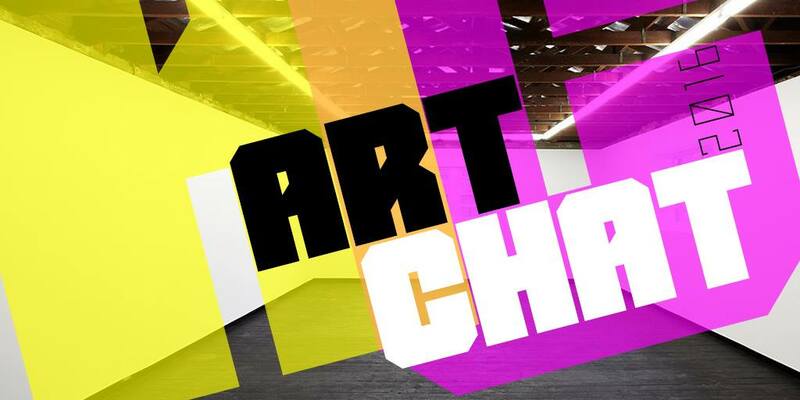 I was invited by Museums and Galleries of NSW to present last night at ArtChat. Fast chats on hot topics! 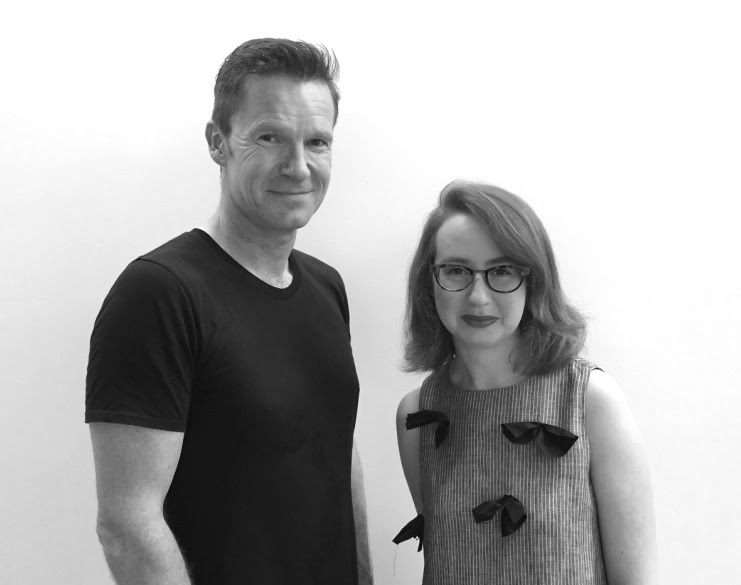 In the fourth of this annual series, ArtChat featured a line-up of established and emerging independent curators who are all working with contemporary practice across the visual arts, craft and design, time-based and experimental arts. The evening explored imaginative ideas in a fast-paced, invigorating and sometimes humorous format, providing a snapshot of the exciting curatorial projects proposed by today’s creative thinkers. Speakers included Joanna Bayndrian, Bec Dean, Micheal Do, Danielle Robson, Nina Stromqvist, Una Rey and myself. You can watch mine above (please turn up the volume – my voice was not being kind to me that day! 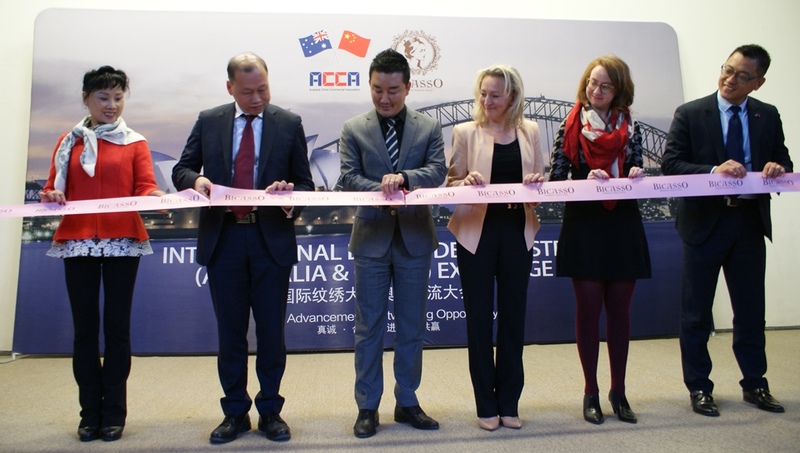 ), and view all the presentations on the MGNSW website. Though a little nervous about presenting I enjoyed the night and it was great to showcase one of my ideas-in-progress to a wider audience. Thanks to Museums and Galleries of NSW and Regional and Public Galleries of NSW for the opportunity. 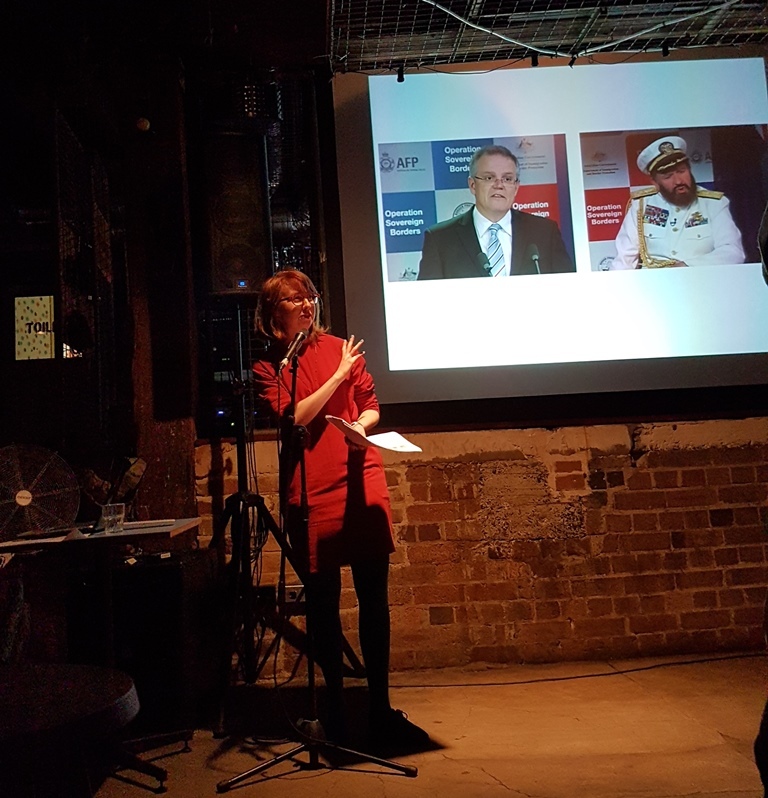 This entry was posted in Curatorial, News and tagged art, artchat, australia, contemporary art, contemporary australian art, curating, curator, curatorial, mgnsw, pechakucha, presentation, sydney on 26/07/2016 by Chloé Wolifson.